When it first began, the drystack industry was primarily a family affair. A mum and dad business that grew up to provide simple storage to leisure boat owners. The first drystack building was built in New Jersey, in the United States. The owner used a forklift truck with modifications to remove the boats from the water and then stack them on the racks inside a building. In those days the average boat length was 20 to 22 feet and a weighed about 1.5 tons. In the 1970’s manufactures started to build forklifts specifically to lift boats. With the innovation of a special negative mast section to lift the boats high er, a second row of stacks could be built on the first without huge investment. As boating grew as a leisure industry more and more innovation in the buildings/racking and for klifts meant that boats as heavy as 10 tons in weight could be lifted to 40 feet in heig ht. By the late 1990’s it was clear that even larger boats could be stacked; and the world’s largest boat handling forklift, a Marina Bull‚ with a lifting capacity of 17 tons and a lift heigh t of 54 feet was built. Time never stands still and the Wiggins company built a Marina B ull‚ that will lift 24 tons. Safety features and the protection of a customer’s boat require new innovations every year as the growth trend continues for the Drystack industry and the size of the boats it handles. At our marina in Portchester, we have huge covered facilities. It makes sense to use them to create a quality drystack for the Solent area. 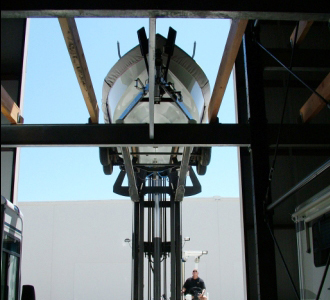 Our forklifts are both Wiggins w3.2 custom build which lifts 60 feet up and 22 feet down below. It’s a natural progression for us to install The Drystack at Trafalgar Wharf. We believe the largest drystack in the UK will be a massive boost to every boat owner looking for a boat berth on the Solent, without the hassle of launching or inconvenience of maintenance. If you’re storing your boat at home, at a marina berth on the south coast or on hard standing, we’d love you to consider The Drystack at Trafalgar Wharf. We’re confident no other boatyard in Gosport, Portsmouth, Hampshire or even the South Coast can compete with our boat storage services. We’re proud at Trafalgar Wharf to be part of a growing industry and to offer the best alternative to Portsmouth Marinas.